I am deeply grateful to have been invited to the weekend gathering of a “practice group” that grew out of a seminar in the Netherlands in the spring of 2010. Denise Alvarez was our gracious host for this weekend, and was joined by Veerle DeBock and Chris Rimmer. 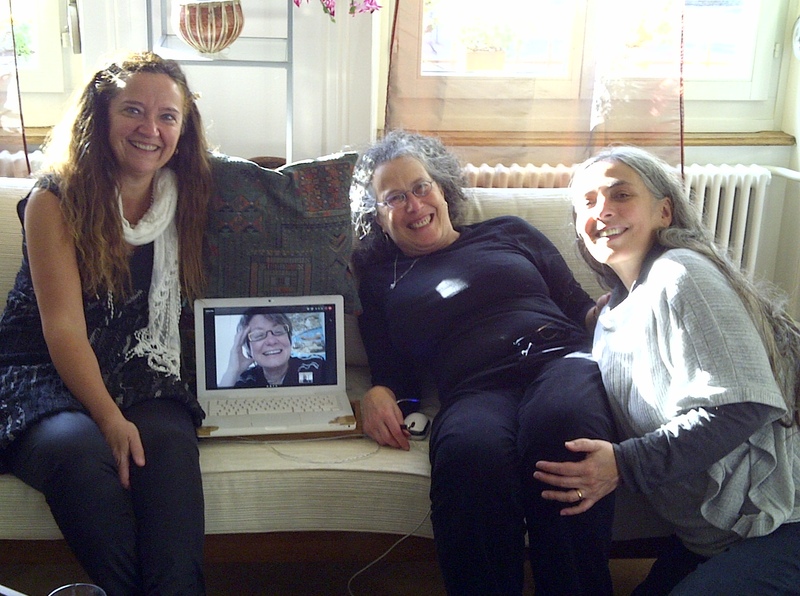 Also, Helma Ton was able to meet with us via Skype. Chris Rimmer took this picture of us in Bern. Another highlight for me in Bern was our group exploration on the subject of money; what it means to us, how it functions in our current system, how we would like it to function. This is a conversation that many of us have been thirsty for, especially given how isolated many of us feel with regard to this area of life, and the consequences that this has for our ability to think clearly and to find new ways forward. The next stop on my journey was “Grenzen-Los” (Without Borders) . This two-day gathering in Dornbirn presented the work of various “BürgerInnen-Räte” (Wisdom Councils and Creative Insight Councils) from neighboring states in three different countries — Switzerland, Germany, and Austria. In addition to learning from one another as a community of practice, the gathering was also introducing this work to people who had not previously experienced it. During the conference, we saw video interviews of people who had taken part in the various Councils. It was powerful to witness how moved the interviewees were, after having participated in these authentic and creative conversations. It was clear that this was not just an ordinary “focus group” or committee process. Following the presentations, participants engaged with one another in World Café and Open Space forums to explore their own responses, questions, and next steps with regard to this work. After the gathering, I had the wonderful opportunity to spend a day in Bregenz with Manfred Hellrigl, the director of Vorarlberg’s “Büro für Zukunftsfragen” (Department for Future Related Issues) that sponsored the Grenzen-Los. As part of their mission to promote sustainable development, civic engagement, and social capital, the Büro has organized over twenty Bürger-Innen Räten within the region since 2006. It was a real pleasure to interview Manfred in greater depth about the work that he and his team have been doing. It was also very exciting to see an early draft of research conducted by the European Institute for Public Participation on the Büro’s work. The plan is for a final version of these findings to be presented February, at an international practitioners’ gathering that Michael Lederer is organizing. Also in February, Rita Trattnigg from the Austrian Ministry of Agriculture, Forestry, Environment, and Water Management, will be sponsoring the second Viennese training in Dynamic Facilitation. Another highlight related to Grenzen-Los was meeting some of the younger staff members of the Büro, who formed part of the hosting team that provided key support for this gathering. Julia Stadelmann, Stefan Lins, and Lukas Weiß affirm my hope that there are new generations who will be carrying this work forward. While in Bregenz, I also had the great pleasure of meeting with Alfred Rindlisbacher, an organizational consultant from the Austrian state of Carinthia. As part of his broader explorations in the fields of synergy, collective intelligence, creativity, and innovation, Alfred has also been studying and practicing Focusing. He is very interested in exploring the interconnections between this “inner listening” practice and the “outer listening” practice of Dynamic Facilitation. Our conversations were very rich, and renewed the commitment we each have to developing stronger connections between these communities of practice. Quite close to Frankfurt is Oberursel, the delightful small town where Matthias zur Bonsen lives. Matthias is the person responsible for having introduced several large-group and dialogic practices to Germany, including Future Search, Open Space, Genuine Contact, and Dynamic Facilitation. In each of these areas, he has invited the founders and organized workshops to help other consultants become familiar with these practices. It was a real honor to share some time with Matthias. One highlight was receiving the gift of his ideas for new material to be included in the next edition of the Dynamic Facilitation manual. I am very much looking forward to incorporating his input in the forthcoming edition. Matthias was also very interested in hearing about some of the recent insights that have been unfolding for me around this work. Matthias also gave me a copy of his book, “Leading with Life”, a distillation of his wisdom and experience as an organizational consultant, executive coach, and trainer, working intensively and very successfully with a variety of processes that support self-organization. While the highly evocative title is in English, the book itself is currently available only in German. I look forward to doing whatever I can, to help make sure that this valuable work is translated into English so that it can have a broader audience. My final destination on this trip was to Much, a small town on the outskirts of Siegburg/Bonn. I was there to visit Holger Scholz, the founder of Kommunikationslotsen, a German facilitation and consulting company. Holger specializes in working with whole-systems change processes. He also enjoys designing facilitation trainings and materials, and his company has a strong graphic facilitation component. Several months ago, Holger had contacted Jim Rough, DeAnna Martin, and me, about the possibility of creating a “Learning Map” for Dynamic Facilitation. He has already created these maps for several other processes, including Open Space, World Café, and Appreciative Inquiry. We were of course very interested, so when I began to plan this trip, I contacted Holger about the possibility of meeting in person. Meeting and working with Holger was a delightful and highly collegial finale to a wonderful journey. As we reviewed the first draft of the map, we had a good opportunity to “talk shop” about the process of helping clients understand the difference between “managed change” and “emergent change” approaches. We also explored the subject of facilitation training, and how it can be a powerful opportunity for whole-person growth and learning, with applications to many areas of one’s life. I look forward to our continued collaboration, and am very grateful for our time together. Beginnings of synergy among “neighboring” practices – I have already mentioned above, the connection to Focusing practice that I share with Alfred Rindlisbacher. Earlier in the journey, it was a pleasure to connect with Denise Alvarez around Internal Family Systems therapy, another “inner listening practice” that is very complementary to the work of Dynamic Facilitation. Denise is a long-term Feldenkreis practitioner who has trained in IFS, and is now in the process of bringing the IFS training to Switzerland. In Austria, Manfred Hellrigl has brought the Art of Hosting training to Vorarlberg, to support and enhance the public engagement work his department has been doing. Christian Hörl and Kuno Sohm, who work closely with Manfred, also have extensive background in other facilitation practices, including Bohmian Dialogue. And in Germany, many of the Genuine Contact practitioners have also trained in Dynamic Facilitation. While it is important to “dive deeply” into any particular practice in order to go beyond a surface understanding of it, it can also be very worthwhile to explore the potential cross-fertilizations and synergies among these various processes, all of which have their own gifts to contribute. Need for translations – I have already mentioned earlier the new book by Matthias zur Bonsen that I very much want to see translated into English. There are also various reports describing the work being done in Vorarlberg by the Office of Future Related Issues, as well as papers by Michael Lederer and others, that would be useful to have in English. It feels key to have learning be a two-way street. Many materials are translated from English into other languages; yet here in the United States, we also need to be learning from work being done in other parts of the world. If there is anyone who may be interested in helping with this work, or who has some leads in this regard, please let me know! Spirit at the Core – It was a deep pleasure to engage in several meaningful conversations during this journey about the central role of spirit in our lives, whether in the form of Zen Buddhist teachings, Native American healing rituals, ancestral Jewish traditions, or timeless metaphysical principles. While this aspect of what we bring to our work, is not often foregrounded in many of the contexts in which we work, it feels very nourishing to acknowledge its presence. In many of our traditions, deep listening is acknowledged as a spiritual practice in its own right. At the same time, our practice of listening deeply is also nourished by our other spiritual practices. Value of interdisciplinary perspectives on dialogue – In many of the conversations I had with others, at some point I shared the short three-minute trailer about the Open Dialogue approach in Finland, that is being utilized so successfully for treating psychosis. In some instances we also viewed portions of the video interview with Jaako Seikkula, the founder of this approach . While most of the practitioners with whom I was sharing these videos are organizational consultants or administrators, rather than psychotherapists or social workers, they still found great value in this striking example of the healing power that emerges from “helping all of the voices to be heard”. I mention this here, as I feel very strongly about the value of making connections, not just between different approaches to group facilitation, but also between different disciplines that are exploring the power of dialogue for generating healing, creativity, and community. Community as its own sector – During this trip, I had a new realization about the potential of Dynamic Facilitation as a listening practice. I began to see how we could be addressing community-building more specifically, as a crucial “third sector” that overlaps in some ways with the worlds of business and government, yet which has its own distinct area of focus. With regard to the business sector, we know that generating a field of authentic and creative conversation can help develop a greater sense of community at our workplaces, as in the Swisscom example. With regard to the government, we have seen how a similar process can serve to increasing community input and participation in our governance structures, as in Vorarlberg and other states. Both of these areas of focus are very valuable, and we need to continue and deepen our work in these areas. At the same time, there is a third possibility, that was exemplified for me at our weekend gathering in Bern; and that is, to focus on our practice as a way of generating community with one another. It seems obvious in hindsight, but I am now realizing that we can be offering this listening practice to people, in another way — not primarily as a way of becoming better facilitators in the business or governmental sectors, but rather as an effective approach for building creative community. As we continue to meet with one another and engage in this practice, we have the opportunity to support each person in learning from whatever life challenges he or she may be facing, as well as to collectively explore the larger social issues we all face. We already know that people who have participated in Wisdom Councils, whether in the governmental or business sectors, often express the desire to “continue meeting in this way”, of continuing to have deeply creative and authentic conversations with one another. To date, we have not really known how to respond to this, given our primary emphasis on applications within the first two sectors. Within the context of the larger journey, the weekend in Bern ended up becoming a revelation about how we might approach our work in a new way, in order to develop this third, complementary sector. During the trip, I had the opportunity to explore this last idea further, in conversations with Denise Alvarez, Manfred Hellrigl, and Holger Scholz; and after I returned, with both Jim and Jean Rough. I am greatly looking forward to taking some next steps in this regard! 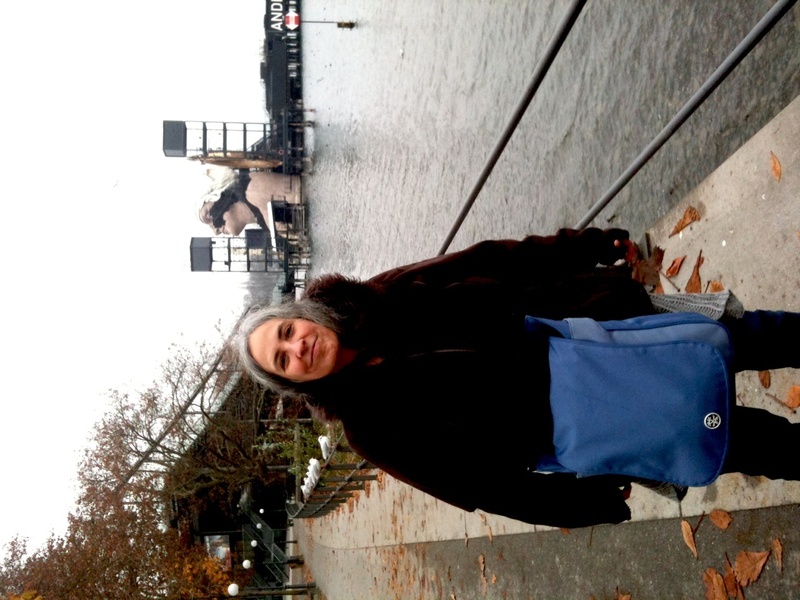 Alfred Rindlisbacher took this picture of me, next to Lake Constance in Bregenz. This entry was tagged Dutch seminar, Dynamic Facilitation, group exploration, Wisdom Councils. Bookmark the permalink. thanks so much for this report. how rich! how inspiring. and i’m delighted to see that new video out about Wisdom Councils! much warmth from a seattle-esque san diego. I appreciate your pulling out the themes of your trip, and resonate with all of them. I’m especially excited in my own work by opportunities for interdisciplinary synergy across related practices. (I’ve merged two of your themes.) Applying our skills to the conversations among practitioners of varying disciplines promises to surface more universal principles and themes common to them all. I know in my own conversations with you and others I come away with a sense of a deeper pulse informing my own work, and a greater appreciation for the work of others. Hooray for dissolving boundaries and heart-centered dialog! Secondly, resonating with your “community as its own sector” theme, I have been feeling a pull to offer a community-building conversation practice in my local area. The intention would not be to solve a big problem or resolve a conflict, but simply to promote the felt experience of communion with others for its own sake through dialog and listening. I am remembering a moment just before the harvesting phase of a group retreat I was helping facilitate (with dynamic facilitation). I invited people to be silent, and to go inside to listen for what was most important to them in all their experiences of the day and looking forward. An authenticity and clarity of sharing, insight, and commitment to action poured forth like a clear mountain geyser. In thinking of that, I know that the practice I want to offer my neighbors will involve deep listening to self as well as others. I’m excited to find out what comes of this offering. Thank you so much for sharing your journey in such a thought-provoking and inspiring way. Joe, I’d love to hear more what such a gathering would look like! that said, it would probably behoove me to ask myself that same question! The link about the Wisdom Council does not work for me. Do you know if I can link to it somewhere else? Hi Ria, thanks for letting me know! I have just added three more links — another HD one and two that are non-HD. Hopefully one of those will work for you!